The Logitech Powerplay Wireless Charging System is reliable, but is it worth the price? I don’t like to sit in one place for too long. I work from home, and throughout the day, I shuttle my laptop and its accompanying cords from the kitchen table, to the desk, the couch, and sometimes to the bed. My laptop charger and the mouse wire dangle behind me, begging my cat to pounce. I’ve never minded the cords or the noise they make while dragging across the faux-hardwood floors. Logitech’s Powerplay Wireless Charging System solves a problem I don’t have. I don’t often feel encumbered by the cord that connects my mouse to my computer. I don’t feel slowed down by drag or restricted by length. The Powerplay system claims to have “solved the barriers to high performance wireless gaming,” using the mousepad as the mouse’s charger. A circular module fits inside compatible mice, which allows the mouse to be charged by the system inside the mousepad using electromagnetic resonance. I like it. I still don’t find cords problematic: I still have to use a lot of them regardless of whether my mouse needs charging, but the ease and comfort of a wireless mouse is surprising to me. The majority of the day, I work from a desk, where the Powerplay system is set up. That includes the base that delivers the charging transmission through the entirety of the mousepad. It looks like a mousepad, albeit with a small dock attached to the top. That dock area is where the mousepad connects to the computer. Logitech includes two mousepad surfaces to sit atop the charging area, either hard or soft. Friction between the two keeps both surfaces in place, and I haven’t had a problem with slippage. I prefer the resistance to a cloth mousepad to the slippier slickness of a hard surface, but I understand that others have swapped preferences. It’s nice to have the option. The Powerplay system works with two Logitech mice, the G903 and the G703. A magnetic module comes with the system that’s easily swapped right into the mouse. Turn the mouse off, plug in its receptor into your computer’s USB drive, and you’re good to go. There’s essentially no setup with the mice and the Powerplay system—it’s really easy to use. When the mouse is on the mousepad, it’s charging. Charging this way is a lot slower than if you plugged the mouse in, but fast charging isn’t what we’re after. With Powerplay, Logitech says the mouse will get a one to two percent charge per hour that the mouse is in use. A mouse sitting idly on the Powerplay system will reach a full charge in 12 hours. Plug the mouse in, though, and you’re looking at a full charge in two to three hours. But again, fast charging isn’t the point. The Powerplay offers confidence that your mouse won’t die during a match. There’s no worry that your mouse isn’t charged enough, or that you’ve got a limited time before it shuts down. If it’s on the base, it’ll stay on. You never have to stop to park the mouse at a dock. You can just do whatever you were doing. It makes using a wireless mouse as effortless as using a wired one—there’s just nothing to think about there. I don’t tote the Powerplay system around with me when I switch positions throughout the day. Instead, I keep the base docked at my desk. The charge I’ve earned from using the system lasts quite a while, and I’m free to move about until the scroll wheel flashes red, an indication that I need a boost at the charging system. The price is high—maybe too high for those waffling whether a wireless system is important for their everyday use. Performance using this system is near flawless. I’ve been using it for over a month and I’m yet to experience connectivity issues or a dead mouse. There’s no lag, and the two compatible mice are perfect for gaming. I prefer the sleeker, G703 mouse, which follows a form that’s reminiscent of the mouse I typically use, the Razer DeathAdder Elite. The G703 lacks the extra buttons I loved on the Razer Basilisk mouse, but this tradeoff may be worth it for those who value a wireless system. The G903 mouse looks like a mouse many would expect in esports—it’s modular with sharp lines. Preference definitely comes down to feel; I like the smoothness of the G703. You may like the angular design of the G903. 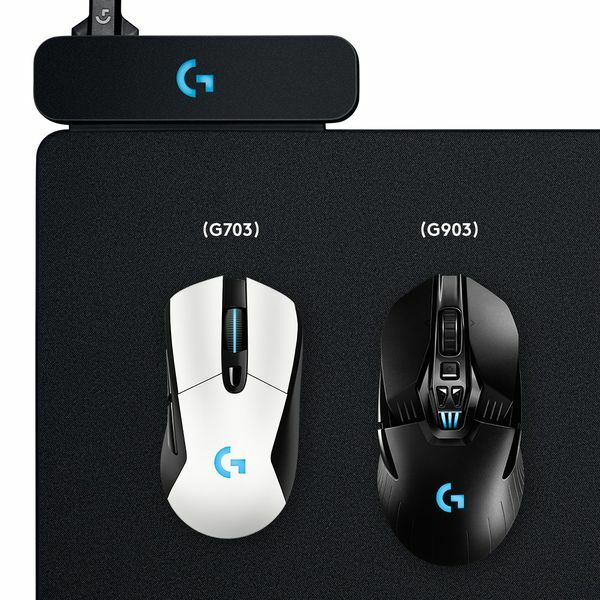 What the G903 does have over the G703 is that it’s modular system allows users to swap out parts to make it compatible with both left- and right-handed use. The one problem I see with the Powerplay system is that it’s expensive. That expense may be worth it to those who value the wireless features, but for those of us who don’t find wires problematic, it’s a hard sell. Even now, after testing out the Logitech Powerplay system and loving it, I find myself asking if I would have bought this myself. (Logitech sent the system and two mice over for review.) The Powerplay system is $100. Paired with the G703 mouse, you’ll be shelling out $200. With the G903, the system costs a whopping $250. It’s… a lot, especially for a problem that you may not even have. But that said, if you’re looking for a wireless system that you can trust, the Logitech Powerplay is that system. The mice that work with the charging station are really good mice, and the system does exactly what it claims it does. Pros: The system works. The Powerplay Wireless Charging System is an exciting new technology that changes how wireless mice stay charged. It’s truly a “set-it-and-forget-it” feature; you won’t be worried about when you need to charge next. Cons: The price is high—maybe too high for those waffling whether a wireless system is important for their everyday use.